A Colorado-based artist has found a unique way of showcasing the art and it is very natural, can we say? 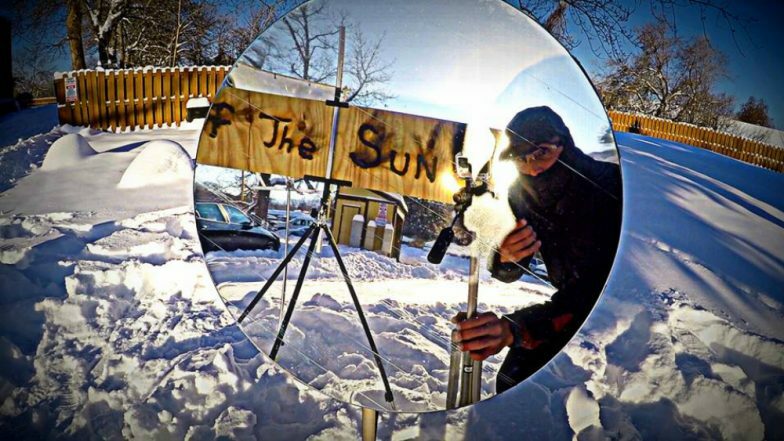 Named Michael Papadakis, uses the sun and a magnifying glass in a manner that the sun's reflection and refraction create his artworks on the wooden canvas with the help of the . He uses the technique of Heliography, a photographic process invented in 1822 meant to take photograph from nature. Five years ago, the artists used the traditional painting and drawing tools but from the time he's discovered the magnifying glass, he has created his own mastery. “When I was in China my friend had a magnifying glass sitting on his table and I vividly remember the sun shining through the window onto the magnifying glass, I instantly had a moment of realisation where I thought to myself, ‘I could probably draw with that'," Papadakis has been quoted to a news report. He gave up all the conventional paintbrushes and started his experiments with the sun's flares. In a town that he stays, there is good sunlight for most days of the year, thus he got a lot of practice. Papadakis basically uses a magnifying glass to direct the sun's rays focusing in a small point and then he guides himself to create designs on the wooden surface. Over the years, he has created animal portraits, nature landscapes, romantic and heartwarming couple designs to even company logos. The time required for each design differs according to the intricacies involved. It can take anywhere from one hour to more than a day. This is an art that makes people stop and stare while he is creating it. But he is not used to such attention and it can often distract him. So he has to tell them to stop. Michael Papadakis talent is really appreciable!